A prominent Iranian human rights lawyer who has represented women arrested for removing their headscarves has been jailed. Nasrin Sotoudeh was charged with several national security-related offences, all of which she denies. There are conflicting reports over the length of her sentence. Her family said she was given 38 years and 148 lashes. Iran's Isna news agency reported she had been sentenced to seven years in prison, with no lashes. Her husband later clarified to BBC Persian that while she had been sentenced to 38 years in total, according to a new Iranian law, she would only serve the longest sentence for one of the convictions, which was 10 years. Another two and a half years were added to this because of the number of charges against her, raising the total to 12 years, he said. Rights groups strongly criticised the "shocking" sentence against the award-winning human rights activist. "Nasrin Sotoudeh has dedicated her life to defending women's rights and speaking out against the death penalty," Philip Luther from Amnesty International said. "It is utterly outrageous that Iran's authorities are punishing her for her human rights work." Ms Sotoudeh's lawyer said she was charged with spreading information against the state, insulting Iran's supreme leader and spying. However, one of the judges told Iran's semi-official news agency that Ms Sotoudeh had been sentenced to five years for the first charge and two more years for the second. She is among at least seven human rights lawyers who were arrested in Iran last year. Prior to her arrest in June, she represented a number of women arrested for appearing in public without a headscarf, or hijab - a punishable offence. Her husband said she had faced at least seven charges in one of two trials - one of which was held without her being present. Ms Sotoudeh is also a former political prisoner - she was jailed between 2010 and 2013 on charges of spreading propaganda and conspiring to harm state security. She denied those charges and while in prison the European Parliament gave her the Sakharov prize for Freedom of Thought for her work representing opposition activists. Correction and update 26 March 2019: We've amended this story and its headlines to reflect the conflicting reports over Ms Sotudeh's sentencing and explain that Iran's judiciary said that it had sentenced her to seven years in prison. 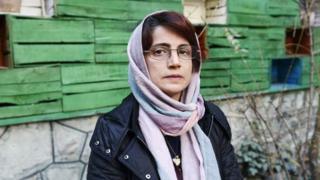 On 13 March Ms Sotudeh's husband, Reza Khandan, spoke to BBC Persian to clarify that she had been convicted of three crimes with sentences totalling 38 years but in fact will serve a maximum of 12 years, per Iranian law.